The death last week of Prof. Festus Iyayi, former president of the Academic Staff Union of Universities (ASUU) sent shock waves across the country. 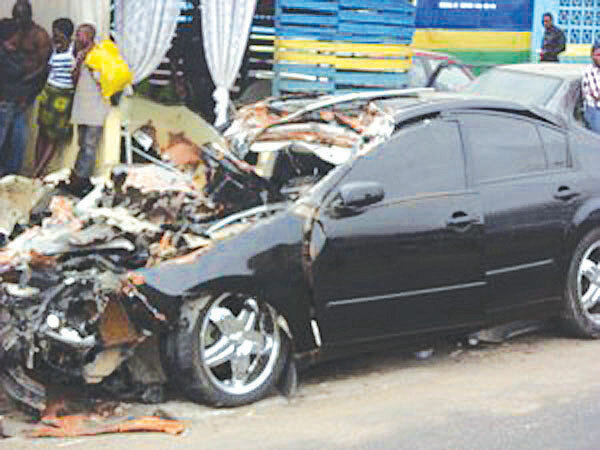 Iyayi, aged 66, died along the Lokoja-Abuja highway in a crash involving the convoy of Kogi State governor, Idris Wada. Sadly, the radical university don is one of the latest additions to the increasing victims of road crashes in the country. Ironically, last weekend, precisely Sunday, November 17, was the World Day of Remembrance for Road Traffic Victims. Introduced by RoadPeace in the United Kingdom in 1993 and adopted by the United Nations General Assembly in October 2005, the third Sunday in November every year is set aside to acknowledge victims of road traffic crashes and recognize the plight of their relatives, who must cope with the emotional and practical consequences of the tragic events. The day focuses on both the overall scale and the devastation caused on individuals by road deaths and injuries, plus the impact on families and communities around the world. It also offers families and friends the opportunity to come together to remember loved ones, highlight the death toll and reflect on what can be done to prevent future deaths. According to available statistics, road crashes kill nearly 1.3 million people every year and injure or disable as many as 50 million more. They are the leading cause of death among young people aged 15–29 years. Every 20 seconds somewhere in the world, a father, mother, son, daughter, colleague or friend is killed in a road accident. For every person killed, the World Health Organisation (WHO) estimates another four will suffer long term life changing injury. In Nigeria, the day’s commemoration has been low-key since 2005 when the UN General Assembly adopted a resolution calling on governments to mark the World Day of Remembrance for Road Traffic Victims. This gap is, however, being filled by an amalgamation of non-governmental organizations, which used the occasion to draw public attention to road traffic crashes, their consequences and costs, and the measures that can be taken to prevent them. The highlight of this year’s event was the call by stakeholders for compensation of road accident victims. 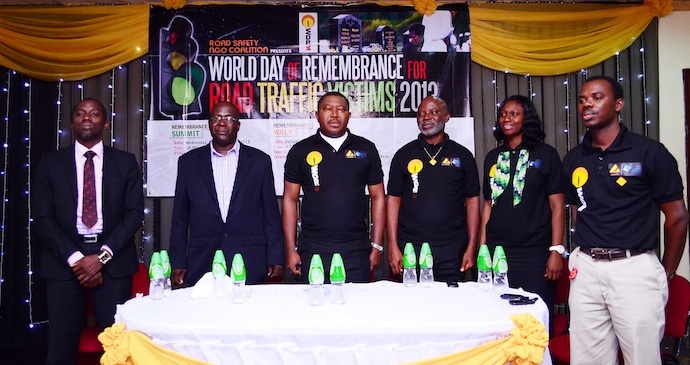 Facilitator of the Remembrance Road Walk held in Lagos on Saturday and CEO of Steerite Driving School, Akinfe Samuel Babatunde, said road transport in the country should be properly regulated. “Road transport shouldn’t be an all-comers affair. It should be duly regulated like the air and water transport system. Until this is done, compensation for road accident victims will be a tall order because the regulation is not in place for insurance companies to indemnify victims’ families,” he said. 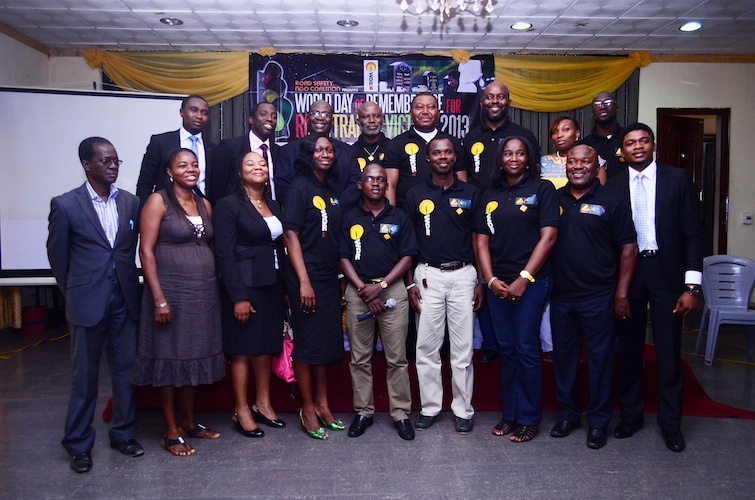 Alonge Kayode of Integrated Corporate Services (left); Prof. Iyiola Oni of the department of Geography, University of Lagos; Lagos Sector Commander of FRSC, Chidi Nkwonta; CEO, Safety Beyond Borders, Patrick Adenusi; Temidayo Ogan of TOCCS Foundation; and CEO, Steerite Driving School Ltd, Akinfe Samuel Babatunde at the symposium. Last year, the focus was the three Ds of road traffic crashes, which are drunk driving, distracted driving and drowsy driving. In furtherance of its mission to ensure safety on Nigerian roads, the Federal Road Safety Commission (FRSC) in Enugu carried its message to the church. The Southeast zonal commanding officer of the commission, Assistant Corps Commander Chike Nwaka, who led other officers of the commission to the Christ Redemption Church, Anglican Communion, Enugu, urged Nigerians to change their attitudes and lifestyles. The visit was part of activities to mark the 2013 Africa Road Safety Day/World Day for Remembrance of Road Traffic Crash Victims. Lamenting the number of deaths and avoidable casualties caused by road traffic crashes, Nwaka called for a collaborative effort among all Nigerians. According to him, “over 200 people die daily in Nigeria due to road traffic crashes. “The road is a place where every habit you have comes to the open. The simple thing they teach us in the church, ‘love your neighbour as you love yourself,’ is very important. If we demonstrate it on the highway, crashes will reduce. You don’t have to lose your cool on the wheel because of the behaviours of other road users,” he said. Today (November 18) is the World Day of Remembrance for Road Traffic Victims. Introduced by RoadPeace in the United Kingdom in 1993 and adopted by the United Nations General Assembly in October 2005, the third Sunday in November every year is set aside to acknowledge victims of road traffic crashes and recognise the plight of their relatives, who must cope with the emotional and practical consequences of the tragic events. The day focuses on both the overall scale and the devastation caused on individuals by road deaths and injuries, plus the impact on families and communities around the world. It also offers families and friends the opportunity to come together to remember loved ones, highlight the death toll and reflect on what can be done to prevent future deaths. According to available statistics, road traffic crashes kill nearly 1.3 million people every year and injure or disable as many as 50 million more. They are the leading cause of death among young people aged 15–29 years. 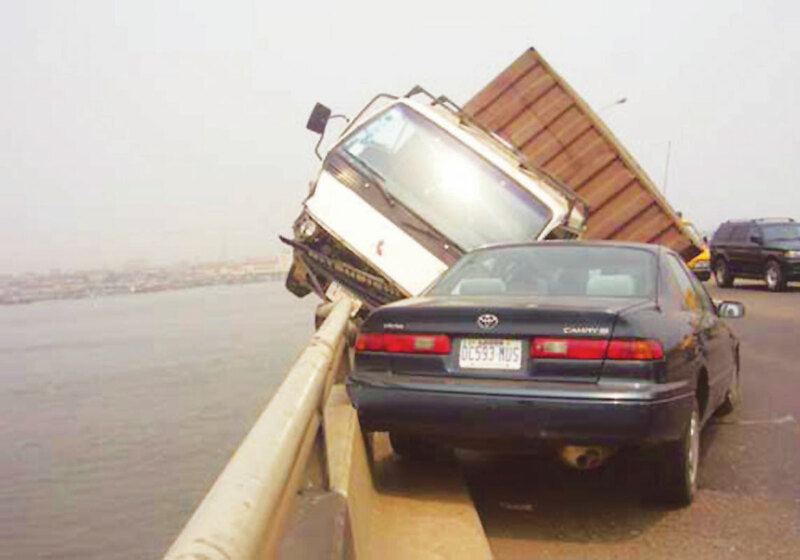 OVERSPEEDING: Major cause of road crashes as captured above on the Third Mainland Bridge, Lagos… recently. Almost 4,000 people are killed and hundreds of thousands injured on roads throughout the world daily. Many more have to cope with bereavement or the effects of injury and thus become part of the huge group of people affected by road carnage. Every 20 seconds somewhere in the world, a father, mother, son, daughter, colleague or friend is killed in a road traffic crash. For every person killed, the World Health Organisation (WHO) estimates another four will suffer long term life changing injury. In Nigeria, the day’s commemoration has been muted since 2005 when the UN General Assembly adopted a resolution calling on governments to mark the World Day of Remembrance for Road Traffic Victims. The gap is being filled by nongovernmental organizations, who are using the day to draw public attention to road traffic crashes, their consequences and costs, and the measures, which can be taken to prevent them. 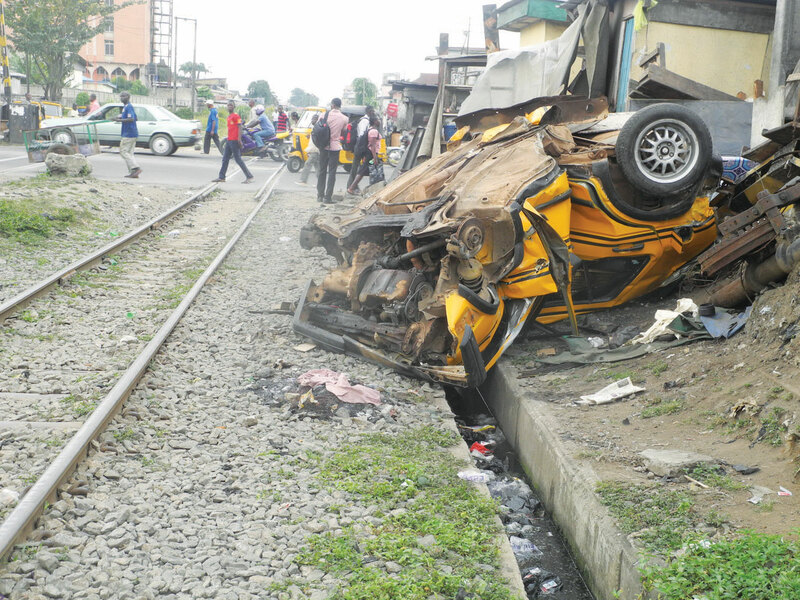 The car crash at Idi-Oro bus-stop on Agege motor road, Mushin, which killed star music act, Dapo Olaitan also known as Da Grin in April 2010. COMEMMORATING this year’s event, Steerite Driving School will from tomorrow till Wednesday hold 90 minutes sessions on the 3Ds of road traffic crashes, which are drunk driving, distracted driving and drowsy driving. With the theme How Not To Be A Victim, organisers hope to enlighten, create awareness and focus on the needless consequences of road users’ actions, while impacting and sharpening participants’ hazard perception skills, which are crucial to collision avoidance and crash preventability. The proprietor of the school, Mr. Akinfe Samuel, said beyond declarations, there should be strategies to achieving resolutions made by the world body. “This is the gap we are filling because regulatory agencies are not living up to their billing. As a driving school, we do our best to give qualitative lessons to learners and corporate drivers. After two weeks, they are released to handle the wheel in a hostile environment. Lagos State Chief Vehicle Inspection Officer, Mr. Gbolahan Toriola, noted that for an accident to occur, three things must contribute to it: the road, vehicle and the driver, “and all lie with the driver, who controls the other factors. Safety lies in our hands and government cannot do it alone. “While we may complain about bad roads, I think it’s a blessing in disguise because the high spate of accidents abroad is because of good roads, where most drivers tend to over-speed and as a result crash their vehicles, many of which find their way into the country,” he said. Former military administrator of old Ondo State, Rear Admiral Sunday Abiodun Olukoya (Rtd), called for support for the new Lagos State Traffic Laws. According to him, Fashola has not reinvented the wheel. “He has only added bite to already existing laws, which is all in the bid to make our roads safer. We grew up in an environment where everybody was safe and you could move free on the road because drivers respected the road and other road users. 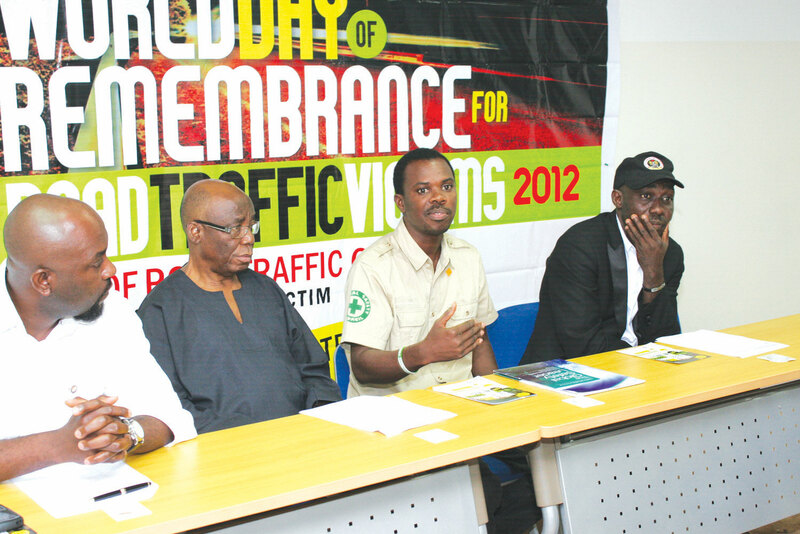 From left: CEO of NUFORSA, Adedapo Oyedipe; Former Military Governor of old Ondo State, Rear Admiral Sunday Olukoya; proprietor of Steerlite Driving School, Akinfe Samuel; and Lagos State Chief VIO Officer,Gbolahan Toriola at the press briefing to announce this year’s remembrance for road traffic victims in Lagos… on Thursday. Partnering with the Nigerians Unite For Road Safety (NUFORSA), Steerlite Driving School is using this year’s commemoration to seek the following from government: recognition of the special day for road traffic victims; erection of a national memorial to road crash victims; funding for key remembrance events; ensure crash investigation institutions are functioning; and ensuring justice, care and support for injured road crash victims and bereaved families. Others include introducing and enforcing speed limits on relevant roads; making road safety a police priority; introducing the strict liability law to protect vulnerable road users with a compensation plan; legislate articulated vehicle operations such as frequent trainings and installing wide-angle mirrors; and allocating funding to organizations supporting road crash victims and post-crash rescue. Never speed or tailgate (bumper to bumper). Never go through red lights. Never drink or drug drive. Never use a phone while driving or any other distractions. Always wear a safety belt and helmet. Give more consideration to vulnerable road users. Install speed limiters in own car. Provide aids for crash victims on the road.